We take pride in our equipment and especially our boats. We spend countless hours with maintenance, safety gear and the latest in electronics. Each and every day our boats are cleaned after the trip with the clients, so it is ready for the next day. The “Cari Lyn” is an Alumaweld Super Vee Pro. At 24′ length, it is 8′ wide. Our Alumaweld Super Vee Pro is powered by a Yamaha V-Max 250hp main engine with a jet pump. There is a ton of power to get to the right fishing spots. We also have a Yamaha T-8 High thrust kicker engine for trolling, side drifting and back trolling. The boat has a 6 degree bottom which allows us to safely run in as little as 6 inches of water with a full load. In the Pacific Northwest a boat with this type of bottom and jet pump is referred to as a “sled” and is designed for running in our diverse rivers. A sled is one of the most versatile boats around. We are able to fish up to 6 anglers in our sled with various seat configurations, dependent on the fishery. Keeping the fishing area clear is important to us. So we keep our gear very organized, using Plano storage boxes. When you fish with us in this boat, we urge clients to be organized too and only bring what they need. Small coolers are best for this boat. Most importantly, dressing for the weather and bringing rain gear if there is a possibility of rain or inclement weather. The “Cari Lyn II” is a Grady White Marlin 28. 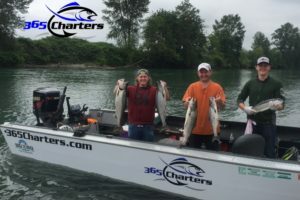 At 32′ 7″ length overall and 10’7″ wide, we have plenty of room for 6 anglers and the boat is very stable in big water. Our Grady White is powered by twin Yamaha 4 stroke 225 HP engines. We also have a Yamaha 9.9 high thrust kicker engine for trolling. The Cari Lyn II was built with the SeaV² hull, which is a “continuously variable vee” hull that delivers a soft and stable ride for the clients. Outfitted with Humminbird Solix 15 electronics, VHF and CB radio, we have the latest technology and experience to get you into the fish. The Cari Lyn II features a 40 gallon livewell, 275 qt. fishbox, an enclosed head and a 300 gallon fuel tank. When the weather gets bad or you need a break, you can head down below to the heated forward berth and relax. We use Cannon Digi-Troll 10 down-riggers for controlled depth fishing. We use top of the line Okuma rods and reels to help you be successful on your fishing charter with us. At the end of your fishing charter, we will clean and fillet your catch. We use industrial poly fish bags to bag your catch to let you transport your fish home. Safety is a top priority for us. Because charter fishing boats are regulated by the US Coast Guard, we must have type 1 PFD’s for everyone. We also have throw rings, throw bags, whistles, flares, and everything to ensure you have a safe and enjoyable trip. Due to the size of our boats, children under 12 are not required to wear PFD’s during the trip. However, if you wish for your child to wear a PFD while fishing with us, we recommend you bring your own. Because we are required to carry type 1 PFD’s, they are very bulky and kids do not like wearing them all day.